Coach said a good way of tracking aerobic capacity during a training run was to warm up for a few km, pick a start and end point a good distance apart, and then run it whilst adjusting effort to remain within 5 bpm of the top of HR Zone 1. See how long it takes, and try exactly the same run in 6 weeks, and then again in another 6 weeks. If my aerobic capacity is improving (i.e. I'm getting more efficient) then I should find that despite keeping within the same HR boundaries, I should get quicker. Sounds like a blast, let's try it. Every Sunday I've been running round Richmond Park (this morning by some mad coincidence I ran past Mr & Mrs PSH who I'd only met properly for the first time yesterday! See previous post for who they are). It's mainly flat(ish) with one minor uphill and a corresponding downhill a couple of km later. I decided to set off and do about 2/3 of a lap as warmup (HR well within Zone 1) then at the bottom of the hill step it up a bit, and run to the bottom of the uphill on the next lap. This should give a test period of about 45 minutes. I then have a further 2/3 or so to finish off well within Zone 1 again. That should be long enough to notice a change even if I only get slightly faster, but short enough that I can manage my heart rate carefully during the period. It's surprisingly hard to manage your HR within such a tight boundary. I found that when it crept up, reducing it was easy (slow down a bit), but the tough bit was getting it to stay high enough on descents. I pretty much sprinted down one or two small hills - and then have to decelerate rapidly at the bottom or it keeps on rising. No chance to relax! Keep checking the watch! So, despite the very (very) slow ascents, and near sprinted descents, I think this counts as a success - I was only out of the target range for a short time, and I adjusted pretty quickly every time. So, 0:46:47.57 is the first data point. I've made a note in my diary to try this again in 6 weeks, and in fact another 6 times throughout the year at roughly 6 week intervals depending what else is scheduled. Ahh, so this is what training is for! I have a history of being fairly spontaneous with my sporting objectives. Where as I'll deliberate for weeks over a new pair of trainers or some socks, I'll sign up for an 8 day 550 mile charity ride in California in the blink of an eye (which is what I did once in 2004, but that's another story). 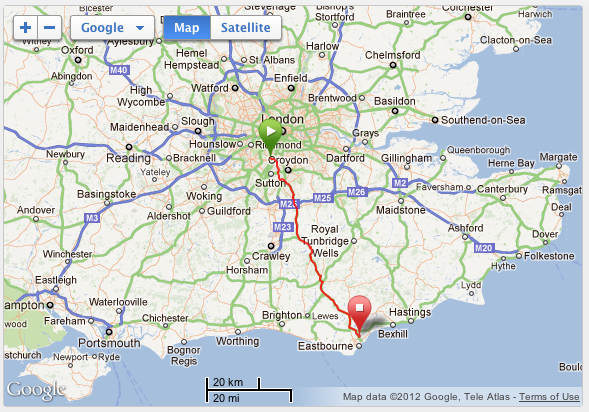 For a while I've been thinking about an early morning ride to Brighton in time to get to Brighton & Hove parkrun. I thought it would make a nice training ride in the summer - its a route I know well, and the sun rising over the downs would be lovely. I wasn't expecting to do it in January, and I wasn't expecting to go to Eastbourne rather than Brighton, but when I found out a week ago that there was the inaugural Eastbourne parkrun event at the encouragingly named Shinewater Park I simply couldn't resist the opportunity for a good long training ride and short run afterwards. Decision made in an instant. I got a good early(ish) night last night, and woke up this morning just before my alarm. I sprang (poetic licence) out of bed at the wholly unnatural time of 03:57 (there's a 3:57 in the morning as well as the afternoon, who knew? ), gathered my carefully prepared cycling kit, and went downstairs for a warming bowl of porridge, banana, sultanas, and squeezy golden syrup (the container is squeezy, not the syrup). Timestamped 04:12AM - that feels a very long time ago right now! I was planning to leave at around 04:30 and everything was on time so far. The route was easy - a couple of local roads and then all the way down the A22. There are more picturesque, challenging, and exciting ways to get to Eastbourne I'm sure - but I was on a schedule, had to run to get to, and wouldn't be able to see the scenery anyway - so A22 it was. An uneventful ride out of London followed. I realised I was riding past Riddlesdown Park at one point, the third of the New Year's Day parkrun triple events. It was nice to think that in a few hours there would be dozens of people making the same journey to their local parkrun. No Riddlesdown for me today, much further to go this time! When I decided on this ride I realised the lights I use for commuting would not cut it. I have a fairly good Cateye light that's probably 5 or 6 years old now. I have it set to fixed beam and velcro a Blackburn Flea flashing next to it. On the rear I have a standard Cateye 5 LED. No one is going to expect a cyclist on the A22 at 5 in the morning, so I needed to beef up my rear (as it were). Additionally, I assumed that parts of the A22 would be unlit, so unless I lit my own way I would be stumbling around in the dark. My front light was good at getting me seen, but not so useful for seeing by. Conveniently the relentlessly fantastic Wiggle Bike Shop were having one of their mega sales and I found a Moon X-Power 1500 for the bargain price of £120, a whopping 60% off the equally whopping non-sale price of £299.99. A crazy amount to spend on a bike light (though you can spend a LOT more) but just the tool for the job. The light was amazing, far better than I'd dare hope - so good that the full power setting made me very concerned about blinding oncoming traffic, so I did most of the dark sections on the lower powered setting, and some on the setting below that. I'm very impressed by the unit - the build quality, packaging, and professional feel all serve to make you think you've got a "proper" piece of kit. If I'd have paid £299.99 for it I would have been happy, but at £120 I feel I secured a real bargain. I enjoy time on my own sometimes, I am at ease with my own company, so I get a lot out of long rides on my own, mentally as well as physically. I've never ridden through the night on unlit roads before, so this was at times a very solitary experience - just me and my cone of light forging a path through the darkness. I really enjoyed it though - though I confess wouldn't have complained if it was a few degrees warmer. It was OK in London, but cooled down a good few degrees across the South Downs, and even more so for the last 15 miles. I arrived at Shinewater Park at 08:20, a little ahead of my estimate. I was the first parkrunner there, arriving at the same time as parkrun founder Paul Sinton-Hewitt (affectionally known as PSH). Paul founded parkrun a little over 7 years ago, growing it into the organisation it is today through passion, enthusiasm, and sheer hard work and determination. I've seen him at parkrun events two or three times before, and even used him to pace myself at Gunnersbury Park once (I hung on for 2km then he dropped me on the long energy sapping hill), but this is the first time I've officially introduced myself. He also knew who I was as we'd exchanged comments on Facebook before, we shook hands and had a brief chat. I was struck by his humility and unassuming nature. If you had taken an organisation from a dozen runners in Bushy park to now, with well over 16,000 running this weekend across in excess of 100 events in 7 countries (and plenty more in the pipeline) it would be easy to be big headed about it, but there isn't the slightest suggestion of that. This was further highlighted after the run when he introduced himself to a runner, and, commenting on his 100 shirt, said "Have you done many parkruns? ", he said he had, nodding and smiling - not a trace of "Yes, I invented it it actually". I have a great deal of respect for that. Being so early, I got asked to be in a few of the photos - so there's some pictures of me, the organisers and marshals, and PSH, Joanne (Mrs PSH), and their dogs. I felt like I'd gate crashed the photos a bit, but darn it I got up before 4am to be here, I was going to enjoy it! Runners started to assemble, and we milled about expectantly. Someone came up to me and with a "You look like you cycled here, you must be Norm" introduced herself as Abradypus (Louise Ayling), someone whose blog I found late last year and have exchanged some tweets with. She had achieved the mammoth total of 51 different parkruns last year, being out of the country for one Saturday she explained. I'm a bit in awe of that - a level of obsession that even I'd be proud of! She's calmed down on the quest for more courses now - but will remain a long long way ahead of me in the Most Events table for some time yet. The run was a good one - it's the most disorienting course I've run so far, and feels a bit like you're running in circles at the start, but the variations in terrain and scenery are good and the 5km flew by. I went to the local eatery for a coffee with the parkrunners afterwards. I spent time talking to the chairman of Friends of Shinewater Park who explained some of the history of the park. It has been restored over the last 20 years, having previously been a rubbish dump! They have big plans for it, including capitalising on the diversity of natural habitats, considering a cafe on site (funding permitting). It's also on the site of a Bronze Age fort. I spent some more time talking to PSH, and Abradypus and a gentleman about training and marathon running, a few random people, and the event organisers. I've never made it to a coffee event after a parkrun, I normally have sometig else to do or get to - so this was a nice experience. I'm glad I hadn't booked a train back until 11am. 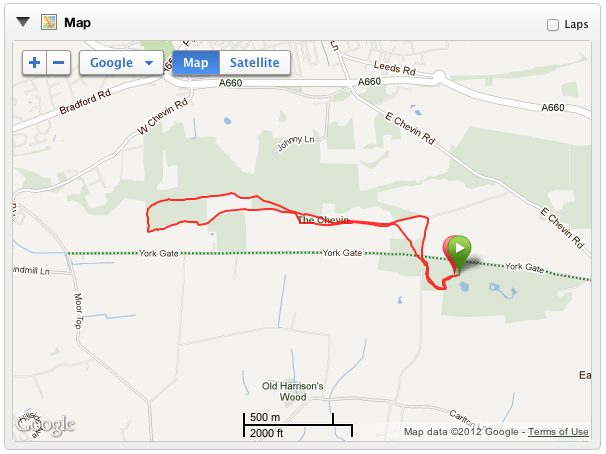 General opinion was that I was a bit bonkers for having cycled down, but I don't mind that. I put in a 5km time of 23:46 and was very pleasantly surprised! My PB is 23:07 so to be within 40 seconds and already having already cycled so far was hugely motivating for me. What's more - within a few moments of finishing I felt absolutely fine again. I seriously considered riding back to London, but decided to stick with the plan and get the train. I have never felt so good after a three and a half hour ride in the freezing cold, never mind a ride that started before 5am and was followed by a very respectable (for me) 5km on/off road run. I'm on the train going back home as I write this, and I still feel absolutely amazing - no achyness, no feeling of processing a lactate buildup (sluggish, tired, weak) - I genuinely feel like I could put out another sub-24 minute 5km right now, or head out for another couple of hours on the bike. Is this what training does? As I've said previously, I've never managed 4 weeks of consistent training before, and whilst I suspect quitting the beers has definitely helped (I've lost at least 2kg since jan 1st), but I can honestly say I have never felt this good after such a session. If this is the result of just 4 weeks, I can only imagine what's to come with a few months under my belt. Consistency is king. I'm so motivated right now - I feel amazing! All of the what can only loosely be described as training I have done over the last couple of years follows a very similar pattern. Have a big night out; resolve that that's enough for now and I really should buckle down; start well, get a good few days in, maybe as much as two weeks; feel amazing, stronger and fitter every day! ;10 to 20 days later growing euphoria erupts and one night (usually after a heavy weights session, there's a definite pattern) have a massive night out. The following day I miss whatever I had planned, maybe miss the day after too, probably go out again, and before I know it there's been a week of nothing - or at least very little. Two great weeks on, one damaging week off. Rinse, and repeat. At the end of of this week I will, for I think the first time in my life, have completed 4 planned weeks of training comprising one complete rest day per week, and one or more scheduled activities every other day. Everything is logged, all the numbers add up, I'm feeling great. But I'm starting to get tired. This morning, getting out of bed was tough, and I mean tough. On only a couple of days in the last 23 have I got 8 hours of sleep, more normal has been 7.5 or 7. This is usually absolutely fine, I have never been a "needs 8 hours or cuts everyone's head off until he's had a few coffees" kinda guy, however with the increased and consistent higher training load I think it's starting to catch up on me. I think Mrs (who has a record of being better at maintaining a consistent training load) has been right all along. We need to get more sleep. Read A brick session to remember: Part 1 for the back story. Huddled under the heater in the foyer of the Chevin Country Park Hotel and Spa, me and Mrs watched a chap park up in the car park and walk towards us. He introduced himself as Alec, an assistant to Jonny and Alistair. Evidently, "the boys" as they were regularly referred to, were on their way, just coming up the hill now. We waited, a little nervously, and made some particularly tiny small-talk. The description had said "train with them on the Yorkshire Moors" and "join them for a run and a bike ride", but we didn't have any idea of what that really meant. The text is always going to imply something amazing to capture the interest, but what would the reality be? Would it be just us and them, or would there be more of an entourage, maybe some other people along as an obligation to their sponsors? The boys arrived within a minute or two. They rounded the corner of the drive way, came up the path, and dumped their bikes on outside. They were dressed identically, and riding identical bikes. They certainly looked the part. They walked straight in and we were introduced. We would be out on our own, the four of us, for "about 90 minutes" (we were asked how long we wanted) and then we'd come back, do a quick change, and go for a run for "about half an hour". Sounds awesome. I asked for a picture. Alec reminded the boys to unzip their warmers so the BT sponsorship could shine through. We've all got the same Gatorade 750ml bottles. It's a sign. I'm not sure of what, though. We set off, out of the Hotel, and turned left. Holy crap I'm cycling with the Brownlees! Very quickly they split up and cycled one each with us, Alistair and me at the front, Jonny and Mrs at the back. It certainly took a little while for me to relax into the ride. We went at a respectable pace, and kept the cadence high. I found it a bit hard to make conversation at first, but soon settled into it. The boys were brilliant with us. Given they didn't know us from Adam (and Mrs Adam) they made us feel very at ease. The roads we were on were part of their training area, though they obviously go a lot further afield. We talked about training (theirs and ours), their races, motivators, technique, and all sorts of other things. They would swap round occasionally, and we both had a chance to have a good chat with both of them. Speaking to Mrs afterwards I think we were both having the same conversations with each of them, but they didn't seem to mind. I spent quite a while discussing grass roots sport with Alistair, and we spent some time talking about parkrun. It turns out Alistair has run parkrun, once before. Leeds run number 71, where he won - taking out the field with a super fast time of 15:36 - over 2 minutes ahead of second place! Here are the race results and his parkrun profile. Mrs and I had decided to ask and see if they wanted to do Leeds the following morning, but they'd already told us they had "hard run training" the next morning, so we didn't ask in the end. Hard run training turned out to be four minutes full pelt on a grassy hill, then a short break, then three minutes, faster, then a short break, then two, and then one minute. A one-sided pyramid (sawtooth?) session. Mrs was doing really well. I knew she was nervous going into the day, and worried that we'd all just zip off into the distance. More than once I was really surprised when we got to a top of a hill, and I turned around and she was just cresting it too - I don't mean that at all condescendingly, I've been cycling years and years longer than her, and more seriously, so I'm really pleased and proud of her performance. We headed out along the ridge towards Ilkley, and then descended fast to the town. Taking a right after crossing Ilkley, we headed back up the valley before turning back round and up a long ascent to where we started. We asked for "about 90 minutes", we pulled back into the Hotel after one hour and 37 minutes. Pretty much spot on timing, not bad for guys who weren't wearing any watches! Basically; down, along a bit, and up. Occasionally when flying round some winding roads on a descent my mind wandered to what would happen if I accidentally clipped a wheel and one of them went tumbling off... "Careless oaf dashes Olympic dream" the headlines would read. Not the best way to end up in the newspapers. Anyway, nothing like that happened! This is the full Garmin log of our ride. We got back to the hotel, completed the longest T2 ever (about 10 minutes) and went out the front to meet the boys again. Mrs and I exchanged looks while we got changed - was this even happening? Running was even more personal than cycling - the four of us could talk together. Well by talk I mean I could gasp the odd question and they could chat happily in response! The most striking feature of our run was the effortless grace with which Jonny and Alistair seemed to cover the ground. Years of drills and circuits, and a mantra that the more time you spend on the ground the slower you are, has led to them almost floating over the terrain. It's a wonder to watch, it really doesn't look like there's enough time spent on the ground to lift off again with any force. Running certainly separated the men from the boys. I found it tough to hang on at times. We were 100% off road, and went through woods, across uneven rocky areas, and sometimes where there weren't any paths at all. The Brownlees grew up in this area and have been running here all their lives - and it showed. Our run route. Note the way it's nowhere near any roads or paths. We talked about running technique, and the benefits of off road training with reducing injury and delivering a more rounded strength workout as no two steps were the same. At the end I certainly felt like I'd run more than 5km, but felt very differently to after a normal run. There was no feeling of repetition in my knees or ankles - I felt more like I'd done a gym session! This is the full Garmin log of our run. We returned to the hotel, I was on cloud nine. We agreed to meet at 7 for dinner (yup, we were having dinner with them too!). Mrs wrote some notes for her blog, I just had a shower and snoozed to repeats of Red Dwarf. I had a really odd dream about losing my way in transition, not having the right shoes (my SPD commuter shoes, not right for my tri-bike), and the lead female runner finishing before I'd even got out on my bike. Very odd. We met in the hotel bar and took a table. Discussing money in triathlon, sponsorship, and the lack of a UK league system in triathlon meaning the boys race for a French team, we relaxed and felt very at ease. It felt like we were just sat in the pub with some mates. For all their Olympic potential, and clear hero status in British triathlon, they're just a couple of guys - happy enough to kick back and chew the fat as much as the next guy. We moved through to the dining room and took our tables for dinner, still the four of us. Me, Mrs, and the hopeful Gold/Silver Olympic triathlon duo. I tried to imagine sitting in a similar place with two footballers - Rio Ferdinand and Wayne Rooney maybe. Not only would you be absolutely mobbed by people and press, but the conversation wouldn't be half as interesting! The Brownlees were well spoken, polite, and interesting. They were bright and articulate. They are and will be great ambassadors for triathlon in this Olympic year, and beyond. We talked more, covering diet (they eat whatever they want, near enough), drugs in sport and drug testing, sports science, training, and other non-triathlon topics. We talked about us a bit too, what we do, triathlon racing experience, successes and failures, and more. They seemed genuinely interested and listened. We wrapped the evening up at about 10. Jonny had to be in in case the drugs testing crew turned up! Apparently you need to give an hour every day and say where you'll be, they can turn up at any time, and obviously without warning. The Chevin Country Park Hotel and Spa. So that was it, our day with Jonny and Alistair. They were great for their sponsors and really did commit a whole day of time - more than me and Mrs ever thought we'd get. That was "meet your heroes" week. I'm not sure I'll have another one like that. I'm sure there will be other meet'n'greet poster signings, but I don't think we'll ever have a day with anyone like the Brownlees again - particularly with no PR, management agents, or entourage. Thanks to Richard Downey from the Professional Sports Group for being so efficient and organised, thanks BT for having a ball, and thank you so much to Mrs for the +1 invite. Most of all, thanks to Alistair and Jonathan Brownlee for a day of your time - good luck this summer, we'll be cheering you on until our voices are hoarse. I'm North of Leeds, near Otley, in an odd but pleasant enough little country spa. It's cold. I've got two racing bikes with me, and untold layers of warm running and cycling gear. I left London at 17:45 yesterday, after work, and drove until about 22:30 to get here, and I've been looking forward to this day for months. Mrs occasionally gets invited to special events through her job, I get to play +1. 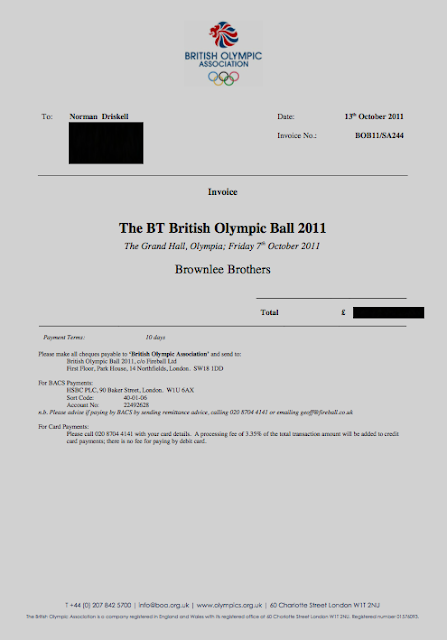 Last year we were fortunate enough to get a couple of seats at the BT British Olympic Ball. This was a fundraising event for the British Olympic Association that was held on 7th October last year at London Olympia. We got dressed up, arrived, at and set about getting acclimatised with the help of a few of the glasses of fizzy that were in generous supply. There were a lot of Olympians, past, present, and hopeful with well over 80 GB Olympic medals had been won by attendees, and hopefully many more to come. Our sporting interests are fairly polarised, so we recognised a couple of cyclists including Bradley Wiggins and Mark Cavendish, and a few others who have are very active in sport and broadcasting such as Clare Balding, but there were many more faces that looked familiar but we couldn't place. All the guests had made a big effort to look their best, and we spent some time admiring the amazing dresses on display. We took our seats and looked through the goodie bags. There was a selection of products from the sponsors, plenty of pamphlets and adverts, and a few moments. I was particularly happy to get some chocolate from the BT Tower [@bttowerlondon] - we chat occasionally on twitter, and he/it even put my name in lights last summer. Don't judge me, I often speak to inanimate objects and have a tendency to anthropomorphise. We hadn't done any research on what the night would involve, and were happily surprised when it turned out that the night was to be comparéd by Stephen Fry and Miranda Hart, both of whom me and Mrs are big fans of. After a song and dance into and a demonstration of some BMX riding where they seemed to spend more time upside down than downside down, Stephen and Miranda entered to get proceedings underway. We heard from many seniors in British sport and the Olympic Association including welcomes from Sir Clive Woodward CBE (Chairman, BT British Olympic Ball), Sir Michael Rake (Chairman, BT Group PLC), and Lord Moynihan (Chairman, British Olympic Association). Before the meal prepared by Tom Aikens (youngest ever chef to be awarded two Michelin stars) Grace was spoken by Denise Lewis CBE, and following food a toast by Ben Ainslie CBE, and a Team GB address by HRH The Princess Royal (President, British Olympic Association). We were also treated to a turn from from Rory Bremner and some entertainment from Tinchy Stryder and Dappy. We ate, and drank, chatted to the other people at our table, and generally had a really nice time getting gently inebriated. 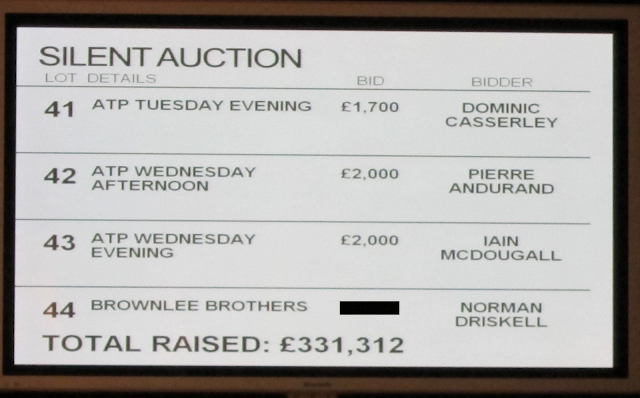 There were two auctions on the evening. One was the Grand Auction, a conventional live auction hosted by Edward Rising, with some big ticket items such as multiple holidays, first class flights to exotic locations, and a battery of Olympic tickets. I have honestly never seen money spent so quickly with the bigger items going for many tens of thousands to much "ooh-ing" and "aah-ing" and applause as each item sold. The second auction was a silent auction that was running in the background all evening. The items were listed in a catalogue and the current bid price for each was scrolling on TVs which were up all around the dining and bar areas. Bids were placed via what resembled credit card and PIN pad readers, one on each table. The cards for this auction were provided in the goodie bags, and unique to each guest. They were registered to you by filling in the registration card and handing it in to one of the helpers who were on hand. One of the items in the silent auction was a training day with the Brownlee brothers. Note the picture, it's an unrelated GB age-grouper also named Brownlee! Two guests will meet Alistair and Jonny Brownlee - the athletes to watch in the world of elite Triathlon and train with them on the Yorkshire Moors where they are based. Jonny is currently Sprint Triathlon World Champion and his older brother Al is European Triathlon Champion. You will join them on a run and a bike ride in the countryside surrounding Leeds and have the opportunity to take photographs and get autographs. We talked about what an amazing day that would be, and given that there were no bids yet, the reserve was affordable, and we were both nicely lubricated by now, we thought we'd kick it off and place a bid at the reserve price. Before long someone outbid us. Oh well, never mind. Although it was still an affordable amount. A shared thought and knowing look. We placed another bid. Excitedly we watched for our lot to come round again on the TV. During dinner the price edged up slowly. It was starting to get a bit out of control, and moving from the realms of an unplanned but affordable impulse purchase to something that would require some planning to fund. We worked out what our maximum would be, gulped a bit, and placed the bid. Then an amazing thing happened. Stephen and Miranda wrapped up, and announced that Tom Jones would be playing a set! I'm not a Tom fan, but the opportunity to have a dance to absolute classic songs, and be within about 2 metres of the man strutting his not inconsiderable stuff was too good to miss. We went for a dance. As is often my way, I danced for perhaps a bit longer than was necessary. Thankfully, there were no podiums. I had to drive up to Wakefield the next day for a stag do, so we couldn't sty out for too long, so at about midnight and before the taxis turned into pumpkins and our clothes to rags, we gathered our things together and set off home. 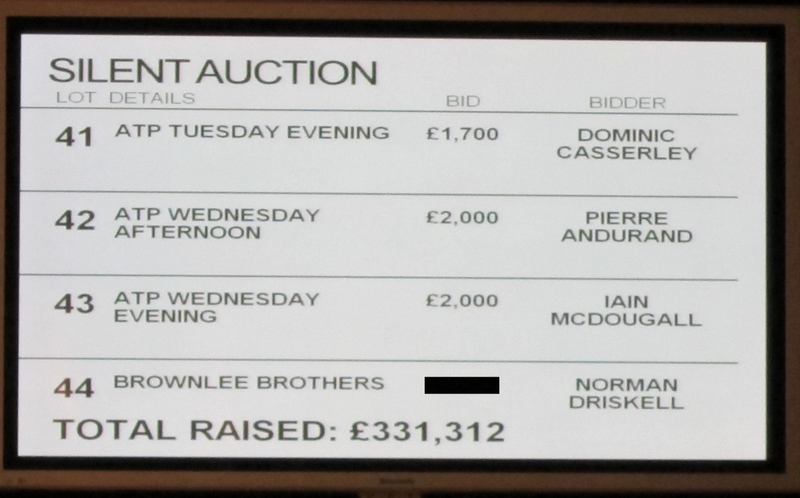 On the way out, and really quite tipsy by this point, I insisted we waited by one of the TVs to see where the Brownlee bidding had got to. No further bids had been placed since we were last outbid - it seemed clear that just us and one other bidder had pushed the price to where it was now. Well, I'll have the last laugh! I popped over to the nearest table, borrowed their card reader, and nudged the bid up another few hundred - that'll teach him! We left and headed home. The next day I got worried that we might have accidentally won, but I got no phone call or email, and after a few days thought nothing more if it. At least we'd pushed the lot up to a good price, and done our bit for the Olympic movement. And this is how me and Mrs ended up in North Yorkshire, huddled under a heater in the foyer of the Chevin Hotel and Spa in full cycling gear, waiting for Great Britain's triathlon prodigies and Gold/Silver Olympic Triathlon hopefuls Alistair and Jonathan Brownlee to come and meet us for a bike ride in the countryside, followed by a bit of a run. The state of play when we left at midnight, and that's the way it remained. Oops...! I'm a relative newcomer to triathlon, but already there are three individuals who have never ceased to affect me with their dedication, athletic achievement, mental strength, and utterly inspiring performances. This week I am lucky and honoured enough to be meeting them all. Since just before Christmas, AudioFuel have been running a promotion on twitter. Donate £5 to Challenged Athletes Foundation and be entered into a draw for a ticket to an audience with Chrissie at a bike shop in London where she was to launch Tri Harder, a new collaboration between her and AudioFuel, and then hold a Q&A and meet and greet, pose for photos, and give out autographs. Me and Mrs entered and thought no more of it until last Friday I got an email telling me where to be and when! What a great start to a Friday. Mrs checked her mail and didn't see one - awww, it's OK honey, I'll take some pics and get something signed for you- but no! There it was! Mrs was coming too - it couldn't be any better. So on a pleasant and mild January evening we made our way excitedly to a bike shop I hadn't been to before called Bespoke Cycling [@bespokecycling] in Farringdon. I'll definitely be going back, there's a large quantity of bike pr0n there to be drooled at. There were 100 tickets available, and there seemed to be about that many there, give or take a few. I don't know if the event was oversubscribed, or by how much, but it was clear we were going to get a real up-close and personal experience. Chrissie started off with an introduction to her AudioFuel workout sessions - a preparatory piece to get you in the mood before you head out "Lace-up with Chrissie", some big cycle and run sessions "Run Faster" and "Bike Harder" both available in different workout durations, and a relaxation mix called "Relax with Chrissie" for winding down and visualisation during rest periods. A trainer from Barnes named Elly did a demo on the bike, and then Chrissie took to the treadmill. The chap from Audi Fuel who was on the mixer let her have about 30s of warm up, and then jumped to one of the 30s intervals which she took at 18km/h. Although she was clearly needing to work to sustain 18km/h, the fluidity of her running was astounding. There was no unnecessary movement, she was perfectly aligned, and it looked biomechanically very efficient. I'm no sports physiologist, but it's clear she has an enviable aptitude for running - which explains her phenomenal run at Kona last year, and why the press ask her if she plans to take on the marathon at world athletics level. She then moved to a Q&A session to the audience and fielded questions about winter turbo training, when to use the Audi Fuel sessions, her state of mind during Kona, and many other topics including a couple via twitter. She clearly relaxed during this part of the evening and seemed much more comfortable fielding questions than fulfilling her marketing obligations. She gave long and detailed answers, and I felt shared some truths about her 2011 Kona race and her psychology during the event. Chrissie learned that day what it was like to stand on the start line and genuinely not believe that she was going to win - and as undefeated over the Ironman distance that must have been a tough lesson. She was racing against herself, to do the best she could. As the race panned out though, and she moved up through on the bike and then reeled people in on the run, it became for maybe the first time for her a real genuine race - she had to give it everything to catch and beat Miranda Carfrae in the closing stages. She gave it everything to do that, and it made for a wonderful experience as a spectator, and the victory even sweeter for her. I've entered IM Wales as my first full Ironman distance event. Do you have any advice for the excited first-timer? Chrissie explained that with Ironman distance racing, as it takes so long to prepare, you have to enjoy the journey. Don't focus too much on the day - particularly this far out - but think about your training, enjoy the progress, get your build up races booked in, and find where your limits are during training. Don't fall into the trap of thinking you need to do tens and tens of hours per week, make each session count. Good advice. I need to stop thinking about Wales at this stage, it's just too far away - instead focus on consistent and productive training. I've never managed to sustain a set programme for more than about 3 weeks in a row before. That's my biggest challenge right now. Following that we queued up in a mainly orderly fashion to get an autographed poster, and exchange a few words. Again I was struck at how personal she made the experience, Mrs and I were talking to her for what must have been a couple of minutes at least, and there were 80 or more in the queue behind us. I hope they all got the same opportunity. Following that excitement, we went off to Ginnan chinese restaurant and had lovely pork and vegetable Gyoza followed by Chicken Katsu Curry. Our first meal since quitting the booze. No beer didn't seem to be too much of a problem, and it made the price a nice surprise! What an amazing, inspiring, and motivating day. I feel privileged to have spent some time in the company of Chrissie Wellington, and I'm sure I'll be talking about it for quite some time (do stop me if I bang on about it too much though). Oh, and me and Mrs are off to meet the Brownlees on Friday, but I'll tell you all about that at the weekend. I've become a bit of a parkrun fanboy of late. I signed up way back in 2009 I think, but it took far too long before I ran my first (I so wish I'd done that sooner) - in fact, I was in the US on business and my Mrs got bored and went and signed up and ran one. Well after that I had no excuse. My first run was Wimbledon Common, my home run, on April 24th 2011. Then, I was up north visiting my Dad. I'd just picked up a new car and fancied a drive. A trip over to Hull seemed like a good idea, so I thought I'd take in Hull parkrun. And lo, my parkrun tourism career was born. I decided a good challenge for 2011was to be on the "most events" board - you need a minimum of 10 different courses to get on the list. Just about crept in by completing Richmond Park on New Year's Eve (including a flat out sprint in the last 50m with a lady I'd been battling for 3km - one of my most memorable races!). So what next? There's been a lot of discussion lately about parkrunning on New Year's Day, kicked off by Danny Norman and the Marathon Talk team (Tom Williams and Martin Yelling) on The parkrun Show. The challenge was the triple run of Bushy Park starting at 9am, Nonsuch Park starting at 10am, and Riddlesdown Park starting at 11am. The conversation crossed over to Facebook, and became a frequent topic of discussion in my house. 3 park runs; 3 hours. You're on. I thought a nice addition would be to make it more "spirito di parkrun" by cycling between the stages. Me and Mrs set off for a reconnaissance mission last Tuesday. Cycled to Bushy Park from home, then rode from there to Nonsuch Park (36 minutes) and on to Riddlesdown (another 36 minutes). The traffic was absolutely terrible, and we weren't really going for it - so I reckoned you could tick them both off in 30 minutes on much quieter roads, leaving the other 30 for the 5km run plus shoe change, bike unlock, etc. The day would really be 5x 30mins effort. Run, cycle, run, cycle, run. The ride to Bushy Park to start, and home form Riddlesdown are not time bound, and so don't count. Full of Porridge and a bit nervous (today definitely felt like race-day) we set off for a gentle ride to Bushy Park (11.8km, 34 minutes, 270 calories), locked the bikes near the finishing chute to minimise extra walking, and set off for the start. An accidental event PB for Bushy Park to kick off the day. We started on the dot of 9am thankfully, and I tried to take a solid stable pace. Set off a little fast and consciously slowed down during the second km to a steady pace. I let myself get overtaken and didn't try to catch anyone's heels - today was not a day for the red mist to descend. I lost the Mrs within the first 50m, a casualty of my overzealous start! I finished, got bipped, and followed my transition drill. Jumper on, change shoes, helmet on, a quick gel, unlock bike, lock in bag, bag on back, gloves on, set off. Rode quickly, but not flat out, to Nonsuch Park. 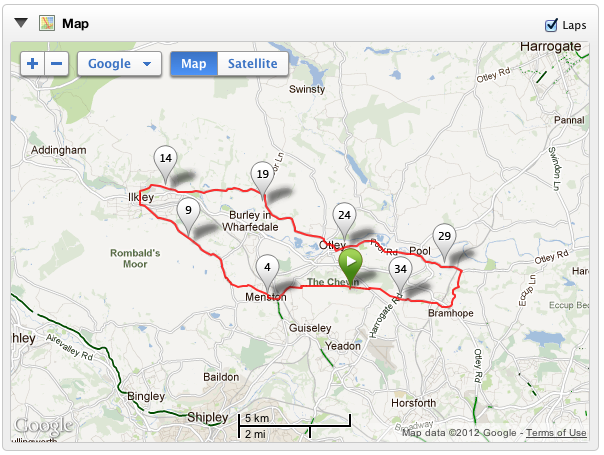 The route was quiet and fast, uneventful apart from an annoying headwind that kicked in after crossing the A3. I got to the Park at 9:54 and quickly transitioned again, and jogged down to the start. After a race briefing (enough already, let's get started!) we set off at a couple of minutes after 10. A slower run here - mainly due to the muddiness of the course. I last ran Nonsuch on their first event back in September, it was a lot drier back then. I tried to make good time, but was feeling it in my legs. Maybe the sprint finish at Richmond yesterday hadn't been such a great idea! I finally finished, had another quick transition, and set off to Riddlesdown. By my watch I was leaving at gone 10:30 - it was going to be a mission. The route to Riddlesdown is hillier than that from Bushy and I could really feel it in my legs. I tried to save something for the end but was very aware of the ticking clock. I threw my bike down, dumped all my stuff on it, and asked some nice volunteers in a tent where the start was. Riddlesdown Park is the only one of the three I haven't done before. They pointed over a field and said the event was starting late - I may be in with a chance! As I summoned all my strength to run to the start I passed groups of people, all shouted encouragement - and in the distance I could see a stream of runners heading over another field - I'd missed the start! I ran on over anyway, being directed by marshals, ran right through the start gate, and onto the course - I'd made it, I was on my third parkrun. OK, so there was nothing in front of me but an empty field and a tiny marshal in the distance, but I was off! By my reckoning I missed the start by about 5 minutes, so I set about trying to catch the pack. If I thought Nonsuch was muddy, I'd seen nothing yet - this course was unbelievable! Really challenging under-foot, and good fun though. I caught the tail enders after about 2km, and by the finish had worked my way to 143rd out of 176 runners. I estimate my actual time was about 26 minutes, but given my tardiness at the start I can only claim a 31:12. Today's parkrun quintathlon took 2:46:31, I covered 46.45km (15km running, the rest cycle transfers), and I burned a monumental 2,403 calories that I will very much enjoy replacing with left-over Christmas foods and a juicy roast pork belly for dinner. Me and the Mrs took refuge at a nearby pub for a (non-alcoholic) drink, mars bar, chips, and parkrun cake...! We trundled home (19.4km, 50 minutes, 433 calories) in the heaving rain, and got in at just gone 2pm, absolutely soaked to the skin. So what the hell has all this got to do with Ironman and my goals for 2012? Running is mentally and physically my weakest discipline of the three. Historically I have been injury-prone, found it hard to progress, and generally not enjoyed it. The parkrun events have helped me to love running, strive to improve, and the freely available in-depth stats appeal to my OCD side (I log absolutely everything!). It's amazingly inclusive, pays no attention to your absolute ability, but encourages you to push your own boundaries challenge your preconceptions. Since I started I've knocked 2 minutes off my 5km PB, now 23:08, and I don't think my Ironman run would be possible without the positivity I get from parkrun. I'm a parkrun fanboy, and I love it!